Welcome to the Well of Segais, a Vermont based Seed Group of the Order of Bards, Ovates and Druids. If you are an Order member and would like to join our mailing list to keep in touch and receive information regarding gatherings and festival celebrations, please click the Contact link above and complete the form. The name of our group is from ancient Irish mythology. One such story tells of King Cormac’s journey to Tir-nan-Og and his encounter with Manannan mac Lir, God of the Sea. The King discovers a pool glowing with ethereal light and surrounded by nine ancient hazel trees. In its waters swim five sleek, silent salmon. 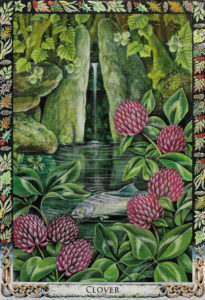 From the Well flow five sparkling streams. The pool is the Well of Wisdom, and the five streams are the five senses through which knowledge is obtained. Druidry is a nature spirituality which unites our love of the earth with our love of creativity and the arts. For more information about Druidry, please visit the main web site of the Order of Bards, Ovates, and Druids here. The site has news, information about classes, and a link to the monthly podcast. A blessing on all your days. 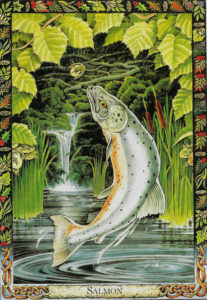 The images above are from the Druid Animal Oracle and Druid Plant Oracle by Philip and Stephanie Carr-Gomm. The artist is Will Worthington. Used by permission of the author.